The Scottish Parliament is to receive new tax and borrowing powers of around £12 billion under plans published today in the Scotland Bill by Scottish Secretary Michael Moore. The Scotland Bill legislation will implement the recommendations of the Calman Commission to improve devolution in Scotland. It will update devolution and introduce far more financial accountability than before. The Bill will bring decision-making closer to the people of Scotland and further empower the Scottish Parliament. The Scotland Bill is just part of the Government’s response to the Commission’s recommendations. The Bill will be accompanied by a Command Paper which sets out how the Government is responding to all the recommendations from the Commission, not only improving the legal framework that established devolution in Scotland, but also supporting the relationships between officials, Ministers and Parliaments to ensure its continuing success. The legislation also provides the Scottish Government with borrowing powers for the first time. The £2.7 billion capital and resource powers proposed by the UK Government go further than the recommendations of the Calman Commission. The Scotland Bill is the largest transfer of financial power from London since the creation of the UK. In future, Holyrood will have to set a Scottish income tax rate each year to raise a significant share of the revenue it spends. This power will be available from 2015 and will apply equally to the basic, higher and additional rates of income tax. When the new Scottish tax system is implemented the Scottish Parliament will be responsible for raising approximately 35% of the revenue it spends with the remaining 65% coming from the UK Block Grant. Key elements of this part of the Bill are the transitional arrangements and phasing of new powers which are designed to manage adverse shocks to the Scottish budget. The UK Government will work closely with the Scottish Government and Parliament over the next four years to finalise all the elements of the new system. 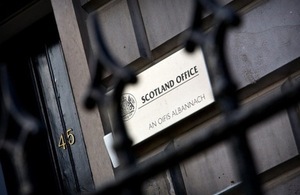 For the first time, the Office for Budget Responsibility will begin to provide forecasts of Scottish income tax, landfill tax and stamp duty land tax. The Scottish Parliament will also be able to introduce new Scotland-specific taxes, subject to the agreement of the UK Parliament. Other financial powers being given to Holyrood include a new Scottish cash reserve and participation for Scottish Ministers on a new UK-Scottish Tax committee (the Intergovernmental Bilateral Committee on Fiscal Devolution). The Commission recommended the devolution of aggregates levy and air passenger duty. The first is currently the subject of EU litigation and the second is being reviewed by the Coalition Government in the light of its stated intent to introduce a per-plane tax. It also provides for UK Ministers to act jointly with Scottish Ministers in deciding who to recommend for appointment as the BBC Trust member for Scotland. “This Bill is the culmination of work by three Scottish political parties, numerous impartial experts, two successive UK Governments and the two Parliaments in London and Edinburgh. “It is a powerful blueprint which will strengthen Scotland by improving devolution. “Future Scottish governments will have more accountability to the public for the financial decisions they make and will have access to significant borrowing powers. Devolution has worked well over the last decade but today’s Bill addresses a number of major issues and takes the settlement forward in a powerful and positive way. “We have created a Bill which is the right one for Scotland and which I am confident will stand the test of time.